What's Next for Windows Phone 7 Games? 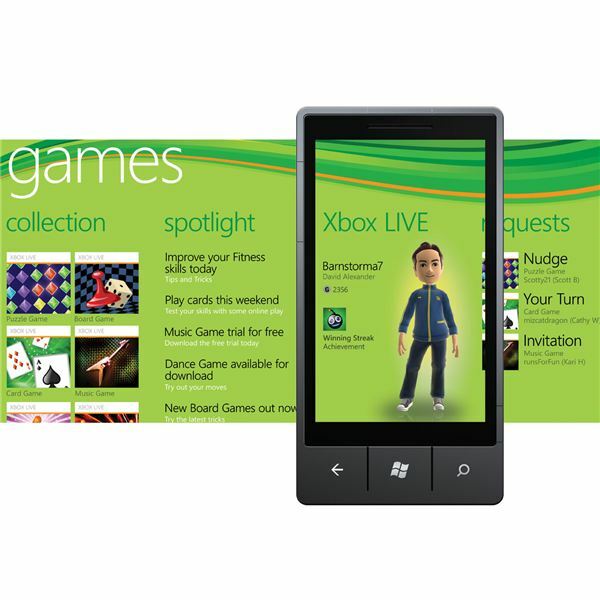 One of the major strengths of the Windows Phone 7 platform has been gaming and in particular the integration with Xbox LIVE. Over the months since the platform launched there have been more and more top titles released, each bringing the validation of a big name gaming franchise to Windows Phone as well as a few unlockable achievements in Xbox LIVE, and this has helped generate some much needed buzz for Microsoft’s new mobile operating system. Things are set to change shortly, however, as Windows Phone embarks on its first major update to the Mango release (dubbed Windows Phone 7.5). With this update a whole host of new features are coming, such as the release of homebrew gaming titles through Xbox LIVE Indie Games, even more top gaming titles and best of all, there are even plans for LIVE gaming to move to other platforms, namely Android. “Windows Phone Mango” as many are calling the second generation of Windows Phone 7 is a massive update brimming with new features and functions that should finally align the platform with iPhone and Android devices. If you ever thought that there was anything missing from the initial release or the NoDo copy and paste update from early 2011, the chances are that the Mango update will quell any fears you might have had over the quality of Windows Phone 7. With Mango comes a variety of new APIs for developers to use, something that will allow a whole new generation of apps to become available for the platform (something that includes a new native Windows Live Messenger as well as a strong possibility of Skype) with functions that simply wouldn’t work on the first generation of devices. This is where the updates to Xbox LIVE come in – as things stand they won’t be possible under the original release or the NoDo update. Anyone with a Windows Phone will know that gaming comes in two flavors. You can choose between Xbox LIVE titles from the Marketplace and pay a little bit more for the privilege of being able to add to your Xbox LIVE Gamerscore, or you can stick to the games that don’t require Xbox LIVE. “Non-Live” games is a section of Windows Phone that Microsoft is nevertheless hoping will continue to grow, and an increasing number of quality games have been appearing under that category recently, with titles such as Penguin, Tumbler and Chess4All proving adequate substitutes for the more expensive Xbox LIVE titles (the latter also featuring online play). After all, there is little compulsion to sign up to Xbox LIVE at present if you don’t already own an Xbox console. Of course, this is something that Microsoft is already aware of, and with the Mango version of Windows Phone Xbox LIVE gaming will have a reduced requirement for access to an Xbox 360. One of the most exciting updates to come with Windows Phone Mango is the new set of functions that will make Xbox LIVE gaming on a WP7 handset possibly the most impressive mobile phone gaming experience around. Among the new features that will be coming to Xbox LIVE on Windows Phone are Avatar Awardables, wearable achievements for Xbox LIVE avatars. While these can currently be edited with the Xbox LIVE Extras app, this new feature should allow gamers to spend a bit more time with their avatars. You’ll also find Game Add-ons, in-game purchases for additional downloadable content such as extra items and new levels, Parental Controls to limit the reach of young eyes on Xbox LIVE (thanks to the release of Splinter Cell: Conviction in late 2011) and most excitingly, Fast Async that will offer an improved multiplayer experience! Amazingly, there is even more coming to gaming on Windows Phone 7 in the coming months as indie gaming makes the move from the console to the mobile platform. While there are many big name games available for Xbox 360, there is also a huge selection of independent titles available via the Xbox LIVE service, and some of these are soon to hit Windows Phone 7. Xbox LIVE Indie Games (or XLIG) are currently unavailable on Windows Phone 7 simply because Microsoft has preferred to focus on big name titles from established publishers such as EA. Recognizing XLIG titles as being suitable for Windows Phone is a smart move, however, and in the first few months gamers will be able to play as a quick-paced robot in T.E.C. 3001, a cat-warrior in KamiCats or enjoy a traditional RPG in the shape of Doom & Destiny. Release dates for these titles are yet to be confirmed, but the presence of Xbox LIVE indie games on Windows Phone is a sure sign of the platform’s continued development. As you can see, there are plenty of changes coming to gaming on Windows Phone 7 over the coming months, largely thanks to the Mango update. Once thing that doesn’t look set to change, however, is the pricing structure. While some top titles might occasionally be reduced for “Game of the Week” promotions, there are few titles that can be favorably compared price-wise to their iPhone or Android versions. Microsoft’s release of Minesweeper and Sudoko as free Xbox LIVE titles over the next few weeks is a drop in the ocean compared with the cries of many users who simply want pricing parity rather than being penalized for using Xbox LIVE on their Windows Phones. A quick look around the current state of console and mobile gaming reveals that things aren't going quite as the leading names might have hoped. While Apple continues to offer iOS as a gaming platform, the wider features and integration that Windows Phone can offer with Xbox LIVE are missing. Most importantly, however, 2011 has not been a good year for Sony. With the PlayStation Network taken offline and consumer reaction to the PlayStation Phone surprisingly muted, Microsoft is in an increasingly strong position. Can they push Xbox LIVE on both Windows Phone and Xbox 360 (and later 720) into the next playing field? Does Apple need a comparable platform to prevent users leaving iPhone in favor of gaming integration elsewhere?